You finally pinpointed that weekend that works for everyone. That one weekend for you and your buddies to live it up like wild men in the wilderness. Except, your old camp lantern broke. So, what do you do? You turn here to find out what is the latest and greatest of camping equipment. You just need to find the best camping lantern for your budget, but the latest and greatest wouldn’t hurt either. Check out the best camping lantern reviews and comparisons. That way, you can move on to more important things like figuring out how you will charge your iPhone in the middle of the woods. The best camping lantern for you will depend on your needs. Will you need it to be lightweight for backpacking? Is it for your emergency kit? There are many considerations to consider. There is one camping lantern that stands out on multiple fronts. The Etekcity 4 Pack Portable Outdoor LED Camping Lantern is a versatile choice for different situations. Now that you have a general overview of the camp lanterns, it’s time to take a closer look. These are the ones that stand out in each category. As mentioned before, the Eteckcity 4 Pack Portable Outdoor LED Camping Lantern is the best choice for general use. It has the adjustable brightness power of 30 individual LED bulbs behind it. The bulbs are lower-powered so they last longer. The lanterns are also collapsible and lightweight so, you can fold them up when you don’t need them or need to pack them. And, you adjust the light brightness by adjusting the height of the lantern. It does take 3 AA batteries for each lantern, but you get the first set free; it’s included in the box. These 3 batteries will buy you a whopping 12 hours of continuous light.The lantern emits light at 360 degrees so, there is no need to keep pointing and repositioning the light. It illuminates where you need it. It’s also made from military-grade plastic. If you are rough with your camping toys, this is good news for you. This lantern is built to last. Additionally, it has a foldaway handle for hands-free operation. You can set it on a flat surface, carry it in your hands, or hang it over your campsite. Unfortunately, these great little lanterns are not water resistant. Not even a little bit. So, you can’t use them if you are going to be out in rainy weather.In addition, some units have inconsistent power for their lights. Sometimes, the light brightness will dim after an hour of use, even if the batteries are brand new. It doesn’t happen with every unit, but you should be aware it may happen. 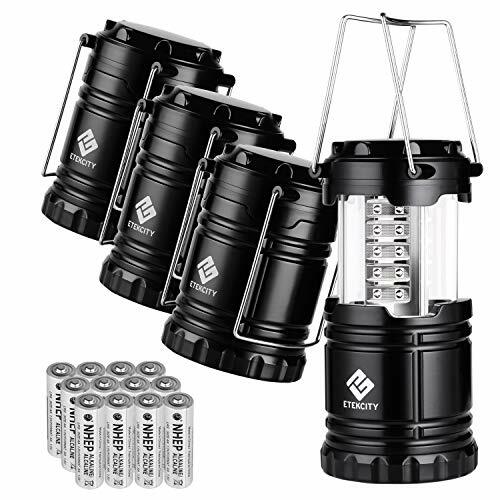 The Etekcity 4 Pack Portable Outdoor LED Camping Lantern is great for general use. It’s even better for occasional household use. Since it is not water resistant, it may not be the best choice for during rainy seasons. However, lazy summer camping days should be fine. This 4 pack comes ready to use with batteries included. And, if you are worried about receiving a defective unit, don’t. Etekcity offers a 90-day money back guarantee and a 2-year warranty on their lanterns. Do you like the great outdoors, but, not the little critters that live outdoors? You will love this lantern, then. 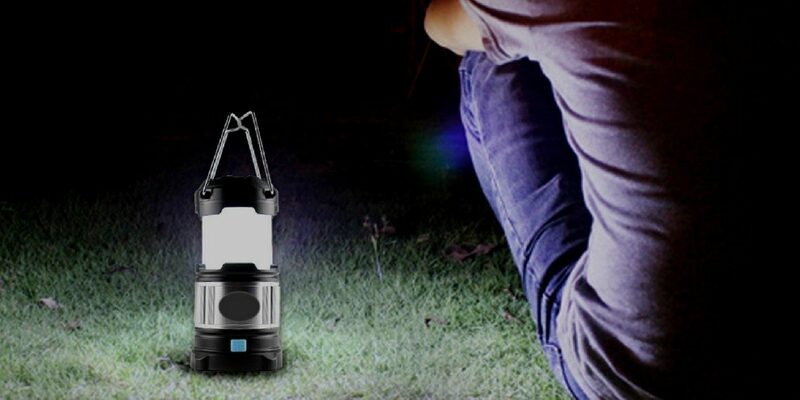 The Miady LED camping lantern is a combination of light and bug zapper. So, no more breaking out the bug spray during your get-togethers outside. And, no more worrying about being supper for bugs. The built-in LED chips light up at 600 lumens. It can illuminate up to 500 square feet because of its wide coverage design. It’s also has a 4000mAh rechargeable battery. The battery is good for 72 hours of working time when it’s fully charged. 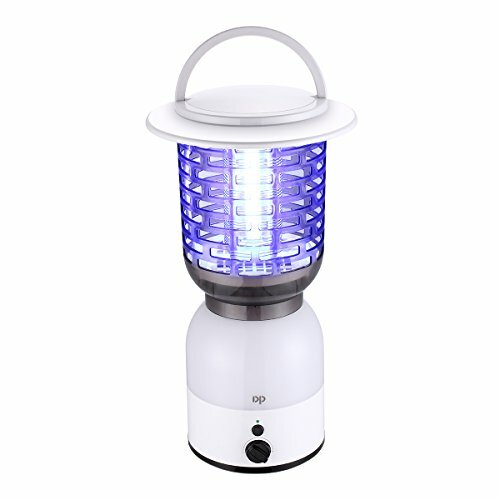 But, as you can imagine this is not an ideal lantern for power outages.The bug zapper feature uses a 365nm wavelength that attracts flying insects. The zap grid kills them when they try to approach. Lucky for you, you only need to clean out the storage box of dead insects. Clean-up afterwards may not be great, but the concept is still a great one. It’s important to keep in mind that the bug light and the camping light use your charge power differently. If you want to use the bug light, it will last about two-and-a-half hours continuously. However, if you want to use the lantern feature only, it lasts longer at 5 hours. And, it takes a while to recharge. True it’s cheaper than replacing batteries all the time, but, count on 7 hours of charging time every time you plug it in. Of course, you can always use the plug-in feature, but outlets are difficult to come by in the wilderness. What stops this the Miady lantern from being outstanding may be nit-picking. But, it would have been better with a solar power feature. In addition, it’s a little on the heavy side at 5 pounds. While neither one of those are deal breakers, they can limit your potential use for it. You won’t be taking this outdoors for too long without a way to recharge it. And, this would take up way too much weight in your camping gear. This is the best camping lantern for those of you who like to take short camping trips, or who like backyard gatherings without the bugs. Even front yard gatherings could make use of this lantern.This is especially good if you have young children or pets. You don’t have to worry about smelly citronella candles or sticky bug sprays. You just clean the bug trap at the end of the night. This is on the pricey end of the camping lantern spectrum but, it comes backed with a 12-month warranty and 24-hour customer service. If you can’t get it working, they will. If you like the idea of 2-in-1 products, this rechargeable camping lantern is sure to pique your interest. Ever forget to pack your flashlights when you grabbed your lantern? Now, you’re covered should that ever happen. 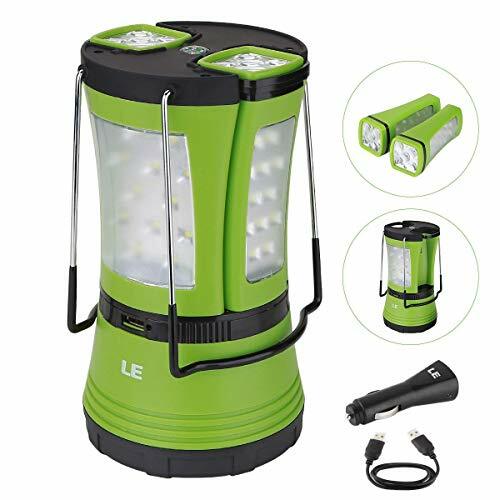 The LE camping lantern has 2 detachable flashlights. You can either keep the flashlights in for extra light or take them off for other lighting options. It also has a 360° beam angle, so you can have light where you need it. There are two charging methods to choose from for this lantern. You can use 3 D batteries to power up your lantern. Or, you can charge up the built-in 1800mAh rechargeable battery via USB cable or car charger. If you are recharging, however, it takes approximately 5 hours to do it fully. The lantern can illuminate up to 600 lumens of overall brightness. It depends on whether you detached the flashlights or not. It is also water resistant with a IPX4 rating to protect from accidental splashes. This lantern also has a compass for those times when you need to find your way. And, it also has anti-skid covered rubber hooks to suspend the lanterns when needed.But, this lantern is not perfect. The USB charging cable is a USB-A male to USB-A. It would be more convenient if it was a mini USB charging cable. 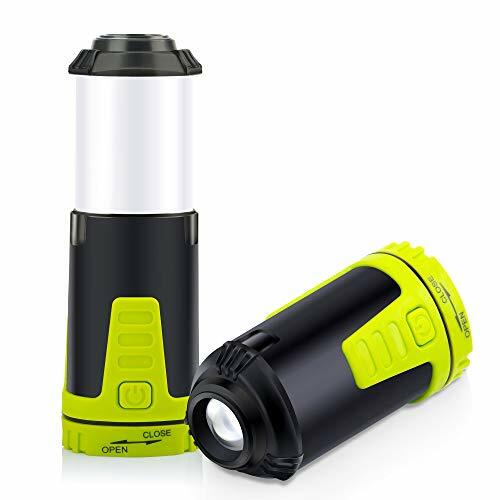 The mini is more common and would eliminate the need to carry another cable around.Also, the flashlights attached to the lantern in a non-locking method. So, if you are not careful they can be knocked out of their nest. And, if you take the flashlights out you don’t have the full 360° range of light for the lantern. Finally, the compass is a nice add-on, but it doesn’t work half the time. It’s not a deal breaker, though, as you probably have your own compass if you really need one. This is the best camping lantern for anyone looking for a versatile, light use lantern. The charging options make it appealing for use in different scenarios. Detachable flashlights come in handy, too. The lantern may be best for home/backyard use and emergency situations. The rechargeable option makes it more optimal to have a car or outlet handy. But, you can still use the battery option if you do want to take it camping. Even though this lantern is rechargeable, remember to stock up batteries. The flashlights take AAA batteries. And, the lantern base takes D batteries. For a more environmentally-friendly option, the batteries should also be rechargeable. 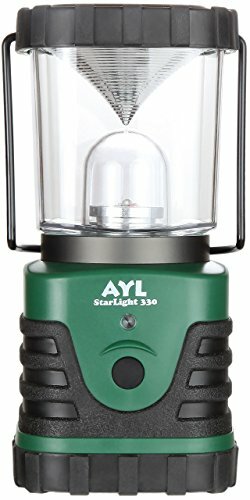 If you want the best brightest camping lantern on the market, AYL’s Starlight 330 is the way to go. It boasts a bright 300 lumens of illumination, and, nothing to detract from it like detachable flashlights. The lantern can provide 360° of lighting, or you can remove the convex reflector cap if you want focused light. It also has 3 lighting modes. Cycling through a switch on the lantern can make the light low, high, or flashing strobe. The hook on the bottom of the lantern allows you to suspend the lantern upside down. The lantern also has a handle on the top, which makes setting up easy if you want to hang it up somewhere or carry it in your hand. In addition, the Starlight 330 is water resistant. It has a triple seal protection against moisture. While you shouldn’t go swimming with the lantern, the rubber and plastic molding will keep out most water. It’s powered by D batteries. Three to be exact. So, while this isn’t a rechargeable model that is popular nowadays, it is reliable, and the batteries last up to 6 days of continuous use. The lantern is also very compact and lightweight. But, some find the green flashing light on the lantern annoying. The light flashes so you can find the lantern in the dark but, there is no way to shut it off. Additionally, the battery compartment can be difficult to get off. If you like to take the batteries out when not using the lantern, this may be annoying for you too. This is the best camping lantern is best for anyone who experiences regular power outages. The blinking light makes it easy to find in the dark. And, hanging it in a dedicated spot won’t have you stumbling in the dark anymore. The lantern can also be for camping, but its small size won’t light up a larger tent by itself. For that reason, you would need a couple or limit the use for smaller tents. One of the biggest annoyances about this lamp is the blinking light. But, if you put it somewhere you won’t see it all the time like the garage it alleviates that problem. The lanterns also come with a money-back guarantee and a lifetime warranty, so you can buy it risk-free. Now, if you have kids you want a kids’ camping lantern that is easy and safe to operate, the Jakemy 2-in-1 is the best lantern for you. This lantern is very small.Collapsed, it is a little shorter than a soda can, but, extended it is a little taller than a soda can. So, it remains small and portable even when extended into lantern mode, and, it fits easier in small hands. The lantern boasts 90 lumens and 360° of light. It also has 5 light modes: medium, high, strobe, and, also a red light and a red strobe for emergency purposes.The power source is 3 AA batteries. And while they’re not included, you may already have these laying around your house. Design-wise, the lantern is water resistant and has a magnetic base. This means that you don’t have to worry about accidental water splashes. And, you can affix the flashlight/lantern to metal bases for easier positioning. Finally, this lantern is small enough to put in your pocket, so, it makes it great for small hands. But, the size may be off-putting for someone searching for a lantern a bit more robust. Also, this lantern could be better by powering it with a rechargeable unit instead of batteries. This is the best camping lantern for home and travel use. It makes a great emergency light because it’s compact enough to fit in a purse or pocket. It can also fit into your little one’s hands. So, you can store them in your children’s rooms as emergency lights as well. This isn’t just a camp lantern; it also makes a great emergency flashlight to store at home or in your car. And even though the unit itself is not rechargeable, you can still use rechargeable batteries as an environment-friendly option. Didn’t see what you were looking for? That means you are still on the hunt to find the best camping lantern. But, do you know what points are important. Here is a quick overview of important features. You’ve seen lumens mentioned throughout this article. Lumens is the measurement of light the device outputs. As you may have guessed, the higher the number the brighter the light. It would be great if looking at the lumen number were that simple. Unfortunately, not all companies measure the lantern lumens the same. Some companies measure the light from the bulb on the inside. But, sometimes they measure the lantern light from the outside. The brighter the light, the more energy it uses. Many companies offered lanterns with multiple light settings. At the lowest range, lanterns will be around 40 lumens. But, they can go as high as 700 lumens. If you are reading this, you’re looking for a camp lantern. But, there are different types of lanterns. The two main types are: gas and electric. Gas lanterns consume liquid fuel or propane. The fuel is like the ones used in cooking camp stoves. Though not as popular, it is still popular with backpackers because of the shared fuel source. The electric lantern, on the other hand, is most popular because of its LED bulb. Typically, they use alkaline batteries. But, some models have rechargeable battery packs, solar panels, and even hand cranks. Run time is important because you don’t want to run out of light when you need it the most. So, you need to know how long your charge is going to last, or you will be sitting in the dark until the sun comes up. Just remember that run times, or burn times, are only estimations. Plan on the lower side of the run times, and make sure to have extra batteries on hand. Many lanterns are “lightweight,” but that term is subjective so remember to check the weight yourself. What the manufacturer considers “lightweight” may be a heavy boulder in your emergency pack. Another consideration is water resistance. It will be hard to find a lantern that is fully submersible. But, many models are water and splash resistant. It’s measured by the International Protection Marking. Generally, the lower the rating the lower the resistance. Here are some answers to frequently asked questions about finding the best camping lantern. They were probably lurking in the back of your head, too. Let’s clear up the mystery. Lumens are the measurement of light from a lantern. The higher the lumens, the brighter the light. If you want to light up your tent, under 100 lumens will be enough. It will provide light without blinding you. If you need to light up your entire tent area, on the other hand, you will need around double that amount. And, if you need to cover the entire area of your campsite you will need over 300 lumens. How Much Run Time Do I Need? This strongly depends on what you intend to use the camping lantern for and how much access you have to extra batteries or power outlets. If, for example, you intend to take your camping lantern out for a 5-day hiking trip you want as much run time as you can find. You also want a lantern that has the most efficient use of batteries. Rechargeable lanterns are not a good idea in the wilderness. Gas Versus Electric Lanterns: Which One Is Best? The most popular, and lightest, lanterns nowadays are LED camping lanterns. Are these the best camping lanterns for you? Unless you plan on being out in wide, open areas or your camping stove will use the same propane source, you may want to investigate electric lanterns. LED lanterns are relatively inexpensive and portable. They are also usable inside enclosed spaces like tents or indoors. Gas lanterns are a fire hazard in those conditions. As you can see, finding the best camping lantern really depends on what you plan on using the lantern for. The specifics change from person to person but, hopefully this article helps you narrow down your possibilities. Finally, the best value you can get from a lantern is keeping you out of the dark. The lantern specs strongly depend on you and your preferences. Size, weight, brightness, and other special features are all great perks, but you really need something that’s run time is dependable. And, just remember if you are opting for a rechargeable lantern, if you are camping in the wilderness you may have problems, unless you really did figure out how to charge your iPhone in the woods.